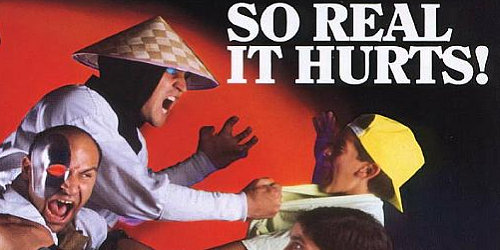 My latest post at PopMatters is about growing up alongside Mortal Kombat. It's kind of a weird essay: part history, part memoir, and a heaping serving of nostalgia all rolled up into a package I hope will seem familiar to some folks out there. The past few months have been full of Mortal Kombat for me. The release of the latest game last spring coincided with some reading I was doing about the U.S. video game rating system as well as the general media climate of the 1990s. Everywhere I turned, I saw Mortal Kombat's influence. It's hard to be serious when discussing Mortal Kombat. The game is inherently goofy. Its exaggerated violence and ridiculous characters simultaneously create and mock video game stereotypes. As far as I can tell, Mortal Kombat has never been about making a grand political statement or leading a cultural zeitgeist. So why do I think that this game about blood and guts is so important? The answer is because people treated it seriously. Ignorant politicians and clueless Baby Boomers saw it as a sign of America's moral decline (or at least a good chance to snag some easy political capital). The older generation's disdain only stoked my enthusiasm: not only was I doing something adults couldn't understand, they were also scared of it. Mortal Kombat, and video games more broadly, became a space to carve out some cultural independence. My friends and I were having fun, but we were also solidifying common generational touchstones. Years later, the phrase "Finish him!" still elicits knowing grins from many twenty and thirty-somethings. The medium has changed a lot since the original Mortal Kombat's heyday. The newest game is probably the most polished, sophisticated version of Mortal Kombat I've ever played. Despite this, its biggest attraction for me stems largely from nostalgia. It's a kind of nostalgia that runs deeper than the pleasure of seeing familiar sights or hearing old music; Mortal Kombat reminds me of a time when I started to become the person I am today. "It's hard to be serious when discussing Mortal Kombat. The game is inherently goofy." Is it? Though the MK games undeniably have a sense of humor, there is also the strong sense that this violence is not merely 'funny,' but sort of viscerally satisfying, enjoyable, and cool. The original MK was advertised as extremely realistic, and the most recent MK is extremely gruesome. The x-ray attacks are designed to add a deeper level of verisimilitude to the violence. Despite the game's cartoonish exaggerations, the gore has always been intended to be shockingly realistic. I assume we're roughly the same age (I was born in 1986), so we grew up in a time when this sort of extreme violence became increasingly normal. But that doesn't /necessarily/ mean it's harmless, or good. Your basic objection here seems to be that some people are taking a video game too seriously, which is something of an ironic complaint to lodge given that your blog is dedicated to the "serious look" at video games. Granted, you say serious "but not humorless," and I agree that much of the reaction to Mortal Kombat and similar games was wildly overblown. (And I'm no fan of censorship regardless.) But as I grow older, I grow more critical of violence in video games. I'm less and less impressed by spurting blood, and more often find it cheap and desensitizing. I'm not saying we should shield young people from violent content, or that Mortal Kombat leads to moral decay. But we should be critical of games that use violence for nothing but shock value, and promote games which explore violence in more thoughtful ways. Why shouldn't we take a serious look at Mortal Kombat? And if we do, what do we really see? Works like A Clockwork Orange are samrt and thoughtful. Mortal Kombat is shallow to begin with and only grows shallower the more we look at it.